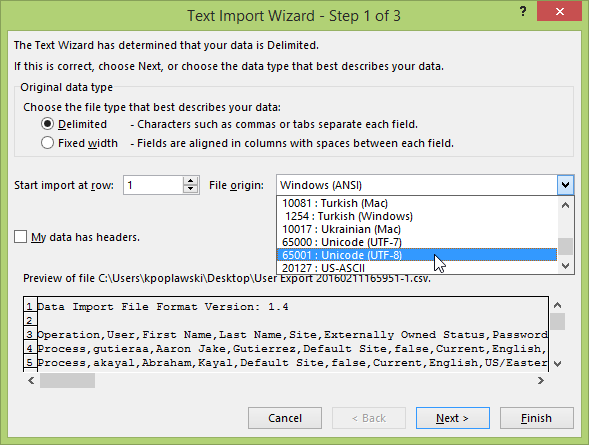 This article describes how to open an exported list of users in Excel and properly display special characters, such as umlauts and accents used in people's names. When you export a .csv file of users from xMatters and open it directly in Excel, entries with special characters will be displayed incorrectly. For example, Adélaïde Mühlhäuser will be displayed as AdÃ©laÃ¯de MÃ¼hlhÃ¤user. This occurs because Excel does not properly detect UTF-8 encoded .csv files, which is the format exported by xMatters. To display these characters correctly, you must import the file into Excel and manually select UTF-8 encoding as the file origin. Export your list of users from xMatters. See Manage Users for more information about exporting a list of users. Open a new blank workbook in Excel. Select the file you would like to load in excel. Continue the import process, being sure to delimit the file by the 'Comma' character. Note: If you use the User Export file to upload users with special characters in their names into xMatters, you must save the file in Excel with UTF-8 encoding. This option is available in the Save As dialog, by selecting: Tools > Web Options > Encoding > Save this document as: Unicode (UTF-8).